Whether you just purchased your watch or have had it for years, it is very likely that someday you will need to replace the band. One interesting way to replace the band is to make your own watch band. This not only allows you to add years to the life of your watch, but also gives you the chance to add your own creative touch. Fortunately, you can make your own watch band quite simply in the comfort of your own home. Measure your wrist. Use a tape measure to measure. Add 1.5 inches to your wrist measurement. This will be the necessary length of the band. Draw the pattern for the watch band. The band will consist of two pieces--the loops and the buckle. Each one of these pieces will require a separate outline. The piece that holds the buckle is shorter and the longer piece has the holes for the buckle. 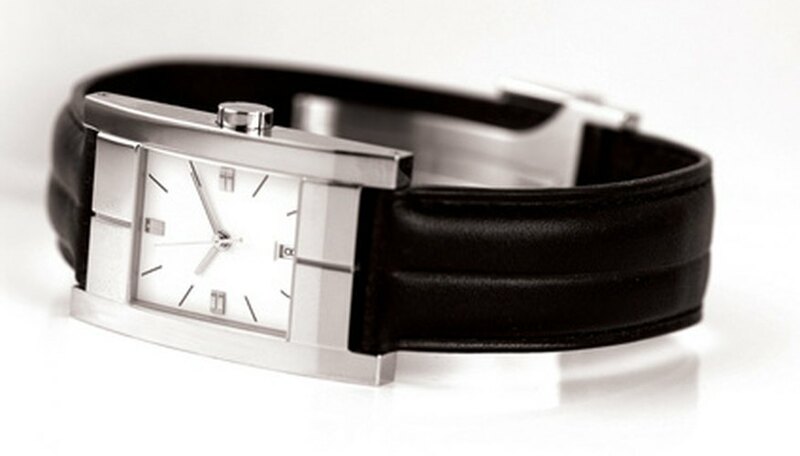 Use a pencil and a piece of paper to outline the two pieces of a watch band. Hold the band down on top of a piece of paper and trace the perimeter of the band's two pieces. Draw the pattern for the loops. Design two loop pieces about a quarter-inch-wide and long enough to go through the band, while still leaving space for the band itself to fit through. Use a a piece of paper and a pencil to draw the pattern for the loops. You can either trace the loops of another band or just draw two quarter-inch-wide rectangles long enough to go through the band. Transfer the pattern onto the leather. First you will need to prepare the leather by wetting it with a damp sponge. Let the leather dry until it returns to its natural color. Repeat this process for each piece. Place the pattern that you drew in the previous steps on the leather with a stylus to make a mark on the leather. A stylus is a special writing utensil that can be bought at your local arts and crafts store. Craft the two band pieces and the loops. Use a craft knife to cut along the lines from the stylus. Use a leather hole punch to make between two and five holes for the buckle. Color the leather piece. Choose a color for the leather pieces and apply it with a sponge or brush. Use coloring that is specially designated for leather. Leather coloring can be bought at your local arts and crafts store. Sew the band together. Fold the shapes so that the top and bottom sides of the leather match up exactly. Put the two band loops through so that the open end of the loops unites between both sides of the shape. Install the buckle on the open end by feeding the end of the leather piece through the opening on the end of the buckle. Fold the top side over the buckle and sew it through the bottom to fasten it. Make a hole with the leather hole punch for the prong on the buckle. Use about 10 stitches for each inch that you sew, leaving an open loop at the end of the watch.